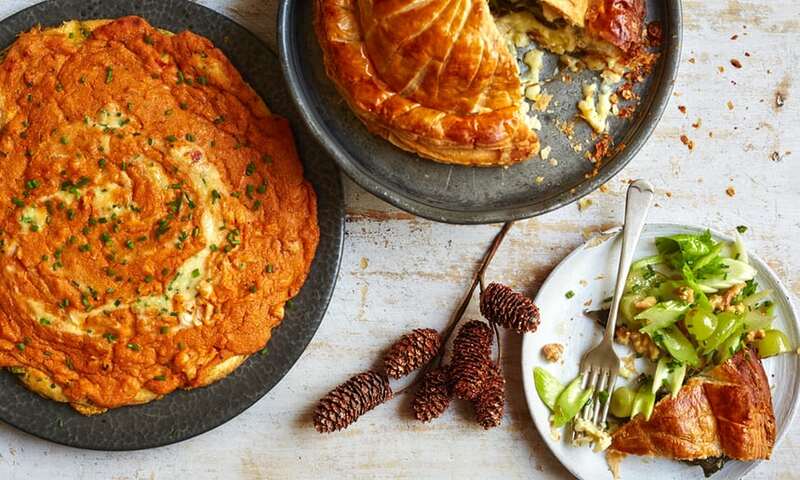 The holiday season is almost upon us, so here’s our final curated recipe: Tom Kerridge’s Whole Baked Camembert Pithivier with Celery and Walnut Oil. If you haven’t had whole baked cheese before, words can’t adequately convey how yummy it is. The cheese becomes hot, gooey, melty, fragrant, awesome when paired with crusty toasty bread… yum! It’ll be a real treat for your family at a holiday lunch, or make a big splash at a fancy party with friends. Great as a starter, or amazing with leftovers. In this recipe, vine leaves give it an extra Christmassy flavour, but if you can’t find those in a pinch, you can always make do with spinach. Not a fan of camembert? Brie will work just as well, for a milder finish. Paired with delicious celery and walnut oils, it’s like a posh version of a Waldorf in reverse, but (dare we say) even more delicious. So get cracking! Tom Kerridge is a British chef, the owner of gastropub The Hand and Flowers. He gained his first Michelin star in 2005 and his second in 2012, the first time for a pub. He’s also appeared in Masterchef, the Great British Menu, and Saturday Kitchen. He presents Food and Drink for BBC Two. Remove the cheese from all of its packaging. Unravel 8-10 vine leaves and cut out the stalks. Dry the leaves on some kitchen roll and wrap the cheese completely in the vine leaves, trying not to leave any gaps. Set aside. Cut the puff pastry in half and roll into 2 circles (about 15cm) on a floured surface about the thickness of two £1 coins on top of each other. Put the wrapped cheese into the centre of one of the circles. Brush the egg wash on the pastry around the outside of the cheese. Gently put the second piece of puff pastry on top of the cheese and seal around the outside. Try to ensure there are no air pockets. Cut around the cheese with a knife, but leave a skirt. Push the skirt together with a fork to seal it down. Brush the whole of the pithivier with the egg wash, then mark lines from the centre of the top down to the skirt with the back of a knife. Sprinkle 50g of the chopped walnuts on top, then put the pie on a parchment-lined baking tray. Leave it in the fridge to rest for at least 1 hour before cooking. Bake in a preheated oven at 200C/400F/gas mark 6 for 25-35 minutes until the pastry is golden brown and cooked. Remove from the oven and leave to rest for at least 15 minutes before serving. Mix together the grapes, celery, chopped chives, cider vinegar, walnut oil and honey to form an almost “raw” chutney. Serve with the pithivier and a large glass of port.